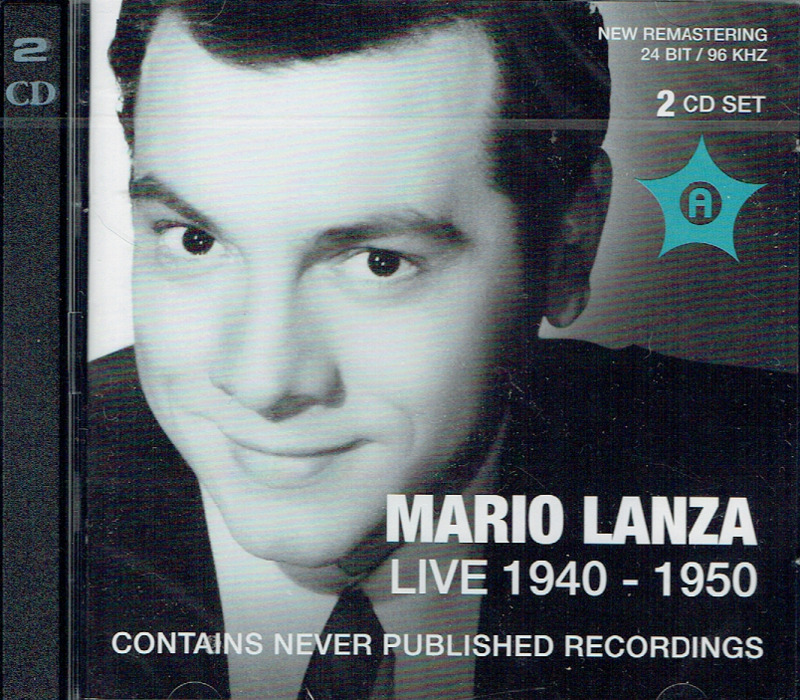 “This same Mario Lanza collection was released in 2013, but I managed to miss it despite my admiration for the charismatic American tenor who burned out young and died much too prematurely. Norbeck, Peters & Ford has restocked it recently, which gives me the opportunity to call it to your attention. 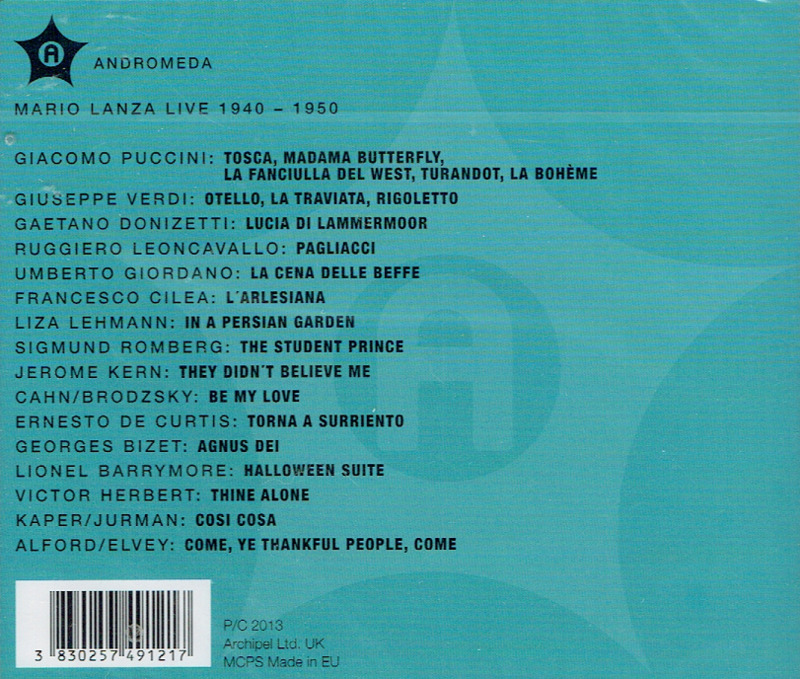 Lanza is, of course, a source of great frustration to opera lovers, because we hear what is unquestionably one of the finest voices of the mid-twentieth century, and we dream about what might have been. The canard that his voice was actually too small for the opera house is refuted by many who heard him live or who sang with him. The fact is that Lanza had a uniquely beautiful tenor, a natural ability to lean into a phrase in an intense musical manner, and at least a rudimentary dramatic sense that allowed him to appropriately convey the appropriate emotions vocally. What he lacked was the discipline to learn complete operatic roles (he sang in only one fully staged production, of MADAMA BUTTERFLY in New Orleans), and his untimely death at 38 assured that he would never fulfill that potential. The material here supplements Lanza’s extensive RCA library, which contains Hollywood soundtrack selections as well as radio broadcasts to which RCA owns the rights. The present set includes other broadcast material and some private recordings. 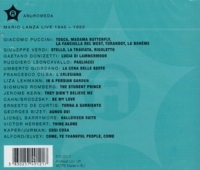 Since Lanza was born in 1921, we actually hear him here at the age of 19 in three private recordings he made for his parents’ 20th wedding anniversary: ‘Vesti la giubba’, ‘Ch’ella mi creda’, and ‘Torna a Surriento’. The singing is as you would expect, raw and unschooled, but the basic sound is unquestionably Lanza, and unquestionably beautiful. Broadcasts from The Celanese Hour: Great Moments in Music, from 1945-1946, already demonstrate his musical development. One can compare here two recordings of ‘È lucevan le stelle’, the first from a 1945 broadcast, the second from an Elgin Watch Thanksgiving Special three years later, and the progress is astounding. The first is beautiful raw singing; the second is shaped knowingly and sensitively, with far more subtlety of phrasing and color. Some material here is extremely rare. A fragment from the last act of LA BOHÈME, with Frances Yeend and George London (as Colline) is the only existing document of the Bel Canto Trio that went on a ten-month U.S. tour performing 86 concerts in 1947-48. Had that been a few years later, someone probably would have managed an in-house pirate recording. One selection that I could have lived without is a sentimental mini-drama written by Lionel Barrymore titled ‘Hallowe’en Suite’ and performed as part of a Hollywood Bowl broadcast. Apparently Barrymore was a composer as well as actor, though nothing in this suite makes any impression. The early (1945) OTELLO excerpts show Lanza with the vocal equipment to sing this demanding music but not yet with a real idea of how to shape it. By 1956, when he recorded the big third act duet and monologue with Licia Albanese for the film SERENADE, he gave evidence of a real grasp of the role. Even in its rudimentary form, however, the two excerpts show a voice of importance and more beauty than many who have sung Otello in the opera house. The test pressing Lanza made for Melotone Studios (the same company that recorded Florence Foster Jenkins) gives us a rare glimpse of a scene from Giordano’s LA CENA DELLE BEFFE, and the 23-year-old already understands the verismo idiom. Some of the radio interviews included as a bonus are impossibly hokey, but they can be easily skipped. The singing on Lanza’s Hollywood Bowl and Toronto concerts from 1948 is the very best thing here, and they are in fact thrilling. “Mario Lanza was one of America's most successful singers and movie stars in the years immediately following World War II. Born Alfredo Arnold Cocozza, he was the son of Italian immigrants, adopting his stage name from the masculine form of his mother's maiden name, Maria Lanza. From the age of 15, he studied to be a professional singer, later signing with the Columbia Artists Management agency as a concert singer; however, his career took a left turn in 1943, when he was drafted into the U.S. Army. Billed as ‘the Service Caruso’, Lanza performed for his fellow infantrymen and also sang in the production WINGED VICTORY; upon his return from duty, he relocated to New York, where he performed concert dates and appeared on radio. One of his audition tapes found its way to MGM's Hollywood studios, and after MGM chief Louis B. Mayer subsequently saw Lanza perform live, he signed the singer to a seven-year contract.